Dr Ji Yu, studied for her doctorate in the Education Faculty of the University of Cambridge, investigating the impact of learning spaces upon student learning in higher education. She explored this topic with a comparative (mixed methods) case study in China. She grew up in Zixi, a town in Jiangxi Province, China. 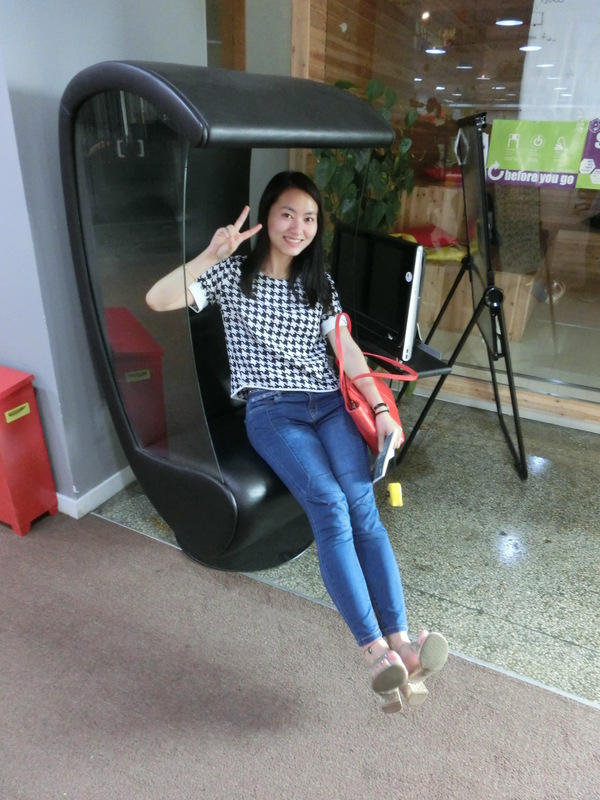 Her undergraduate degree in Beijing was in civil engineering and her Masters studies in Shanghai centred on a comparative study of learning spaces in Chinese primary schools with several Scottish primary schools. I spoke with her on 11th May 2015 in a London cafe, just before she flew back to China to continue her research in the field. Tell me about the first school you went to when you were a child. What did it look like and feel like to you? Well, the first school I attended was the kindergarten but I couldn’t really remember it, so I think …. the one I remember is my primary school and it is very Chinese and a very traditional one. The outlook is very square and it has four floors and there is a big playground on the front (ground) floor. Every classroom was very standardised, it was the same size. I think it was very difficult for children to play because the playground is on the ground floor and most students only have a ten minutes break after classes so it’s not really reasonable to, like, rush into the playground and play for three or four minutes and rush back when the ring comes for the next lesson. So you stayed in the classroom at playtimes? No, because there is a small corridor by the side of the classroom. Most students don’t want to rush to the ground floor, they can just play in the corridors on each floor. How old were you when you went to your primary school … seven? I actually went a little bit earlier, I was six. Because you were very clever? No! Because my mother was a primary teacher, she was a teacher in that school (laughs). So there were rows of desks in the classroom? Yes, it was very standardised. There were rows of desks and chairs, mostly not movable, it’s fixed. And how many children in the class? In my childhood it was about sixty … fifty or sixty. And I think nowadays they reduced the number of children to around thirty or forty. And there were about ten classes in the school at that time. And there were windows in the classrooms? And you sat in the same seat for the whole day? Yes, in the same seat. Was the desk on its own? In my primary school, as far as I remember, it was a desk for two. But I’m not really sure what happens now because maybe they have an independent desk for each person. Was there some time during the lesson when you could talk to to someone nearby you, or were you listening all of the time to the teacher talking? It was very easy to talk to the person who sat just beside you. If you wanted to talk to the people around you, you needed to turn around like this (demonstrates) and so it’s not really supportive for co-operative learning. What did you learn before you came to the school? I’m not really sure. I think I learned a little bit about mathematics and reading at kindergarten, but officially education for reading is in primary school. So you all started from the beginning and learned at the same time? And what happens when children find it more difficult to learn? In my primary school there was a class for, like, special children, if they have a disability or lower ability, but everyone else learns in the same way at the same time. So what was your favourite place in the school? I can’t really remember because there was nowhere too interesting in my school. But I remember there was a big tree in the ground floor, in the playground. I think I liked it because it provided a small place where I could hide. Because my mother was a primary teacher I always felt that she watched over me and she didn’t allow me to eat desserts or small, you know, junk food. And the school would sell junk food to students. And sometimes I would give some small (amount of) money to other students and ask them to buy it for me and I could hide there and eat it. Were there any other private spaces in the school. The toilets weren’t even in the main building for teaching , they were in a very small building outside. Just imagine the toilets … they were very dirty at that time …. Was there somewhere in the school you felt afraid? (surprised) Afraid? No. I felt safe inside this school. But … you know, that building actually was diagnosed as an unsafe building. Because that’s a physical thing and you can’t see it as a child, so I couldn’t really feel it was unsafe. When you are an adult you know it’s an unsafe building but children can’t notice that. Unsafe because it was old? A hundred years old …? Bricks? I think it was bricks. If someone behaved badly in the classroom were they sent to a special place? I think that depended on the teachers. Some were very strict and would probably punish students. Not very often, no. And nowadays that is forbidden in schools. Maybe you had to stand at the back of the classroom, that happened to me as well, it felt a bit strange. But I know when I was a kid I didn’t really feel ashamed. When you are a kid you have a thick skin about those things..
Was there a library, or other types of rooms in the school? My primary school was not a very good one – not a very big one or the best one in the town – we didn’t have a library, but I know the other primary school, the biggest one had a library. Did you eat lunch in the school? No, I lived near to the school, only about ten minutes walk away so I ate lunch at home. Probably if someone lived far away they might eat lunch in school. Was there an assembly hall, or a place for speeches, prizes? In my own experience, the playground is the place that each Monday we raised the flags. So that’s the place where the President of the school would give her speech and every student is there for ten or fifteen minutes. And did you have prizes for good work or behaviour? They had different types of prizes, for example, if you achieved a high score you would get different types of notebooks, or a dessert. If you could change something about that school, what would you change? What colour were the walls? I can’t really remember, I guess just a grey …? And the decoration, any pictures? That’s interesting. In my time the only decoration was ‘A great man says etc. etc. etc.‘ and there is like, these kind of square tiles for decoration, tiles on the floor … tiles of Chairman Mao. And I think that looks quite strange to primary students. And would the children be able to read these words by Chairman Mao? No. I don’t really know … But I think this is strange now because when I did my Masters Studies (2013) I noticed that many primary schools in China put children’s art work on the walls now. If you could set up your own school, what would you do in terms of the building and the space …? .. and to make the children’s results better? Honestly I don’t really know. If we are saying ‘better’ it is related to evaluation so you don’t really know. From a human-centred view, it might be better for them. What do you associate materially with Chinese schools? Well, as far as I remember in China, most primary schools have those windows one by one (in a row) it’s not imaginative. There’s a blackboard in primary school and computers at secondary school and university. Every student brings their own stationery. And if you’re in the classroom, how long are lessons before you have a break? Most classes last from forty to forty five minutes and then a ten minute break. Do you remember feeling happy in your school? Yeah, I’m not really sure which year, maybe third or fourth year, we had a picnic! We had a picnic outside and every student had to bring something – some people brought kitchen stuff, some brought food – and we went to a place where there is a small river and lots of stones and they made a fire and cooked lunch and it was wonderful. But nowadays that kind of activity is a little bit forbidden. That’s related to a kind of phenomenon in China because teachers are always being given too much responsibilities but they don’t really get the same rights. So if there’s any problem happens to the students, the parents will think it is the fault of the teachers. So many of the schools don’t hold this kind of service (event) any more. Did you feel like teachers were watching over you in school? Probably for the first two years, but for older students I didn’t have feelings like that. You visited primary schools in Scotland for your Masters degree, can you talk a little about that? My Masters studies were about a comparison between several schools in China and Scotland. So from my experience it looked quite different in the two countries. I feel that co-operative learning is emphasised in many, many primary schools (in Scotland) because you can see, like, small tables where children can sit and the colour they use is much more colourful. And just to mention privacy, they pay more attention here in the primary schools here – I remember there’s a small space called honeybee, like a private space…. and there was a school in Scotland called Carnegie Primary school, that looks nice. That school is so unique because each classroom can have a view of the outside, it’s a natural view. And children can just push the door – each classroom has a door directly to the playground and that’s so different from China. Do you think Scottish children are happier at school because of this? That’s very hard to say. Have you recently heard about how the UK government thinks that for primary students in the UK, their mathematics is so bad? So they sent a team to China to understand how Chinese students learn mathematics. And if you study that kind of learning in China – it’s more delivered knowledge to learn how to calculate things. So if you think co-operative learning and creative learning is important then you probably think things are better in the UK, but if you think we need better mathematics … um … especially with that kind of knowledge where you need to really remember, I think China has more advantage with that. What was your primary research question when you were studying for your Masters? Actually, it was more of a descriptive study. I think I was trying to compare different things and trying to describe how it was different in the two countries. Were you particularly surprised by anything in the Scottish schools? Yes, as I mentioned, one was the co-operative learning in Scotland. It was so common, in every primary school that I visited. And from my memory, that doesn’t happen in Chinese primary schools. And the other is the natural environment – they really look for children to get better involved in nature. Because in China, school is just a school. It’s just a separate space for school. And it’s very strange, because in China, my primary school was very traditional. But in the dynastic era, in Tang? … one thousand years ago or something like that … people sat cross-legged on the floor and it’s like a group sitting there and it’s called something like bright tutoring. I don’t know why it changed to the lecture-based space (now). And would those Tang era schools have a different architecture from schools in China today? Because it’s a long time ago, I think the buildings would have been the same, but I’m not really familiar with that time. So it’s not because the building is different that they had a different style of learning? Would people in China expect schools to be beautiful buildings? No. Definitely no. It would be strange … I discussed it with my mother and she thinks it is strange to think about space in primary schools. Because it doesn’t feel any different to them, it should be like that (like it is now) … it’s just like that. What about the teachers? What does your mother think about working in a school building? I didn’t really talk to her about that, but she’d say ‘It’s always like that’. You only feel conscious about space when you see different types of space. If you stay there, people don’t really want to make changes. Yes, because with my PhD studies right now, I use the same (research) instruments in two different spaces to measure student learning. And when I hand out my questionnaires, some of the students will ask “Shall I complete the questionnaire just according to this space (that I’m learning in) now, or should I compare in a general way (to other places)?’ and I say ‘Either way is fine because you can’t really tell what kind of thing is in this space and what kind of thing is in that space and the results turns out that in some scales they have significant differences in two spaces. So that’s the thing I want to say, that even though you are not really sure that space exists or the kind of impact it can have on you, but it might still have an impact. But you don’t really realise that. If there was something you learned from school design in the UK that you could take back to China what would that be? As I’ve mentioned – don’t make the playground at the bottom of four floors, because (the students) don’t have time to play. And try to make the whole school more colourful and friendly. Next What are schools for? An interview with Gert Biesta on the learnification of school buildings and education.